A music video by Canadian astronaut Chris Hadfield has taken a Saint John filmmaker's career to new heights. 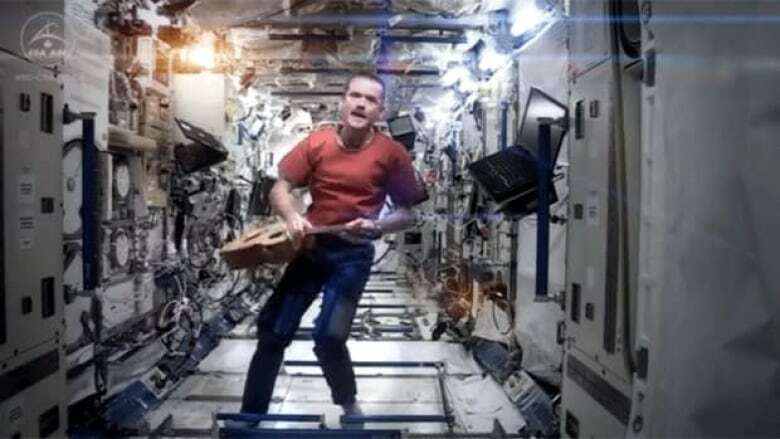 The video of Hadfield singing and playing guitar to David Bowie's 1969 classic Space Oddity has become an overnight sensation, with more than one million views on YouTube. "Yeah, it's broken the internet," said Andrew Tidby, who helped produce the video. "I'm hoping we're going to take out Gangnam Style pretty soon with a billion hits," he said, referring to the viral music video by South Korean rapper PSY. The project was Hadfield's idea, said Tidby, who became "pretty good buddies" with the astronaut while working on a series with the National Film Board and NASA. "While he was up in space he sent me a quick email and said, 'I want to make the first music video ever made in space. Can you help out?' I said, 'Absolutely.'" The logistics were challenging, said Tidby. Astronauts only have about 12 hours of free time a week and the International Space Station cameras hadn't been maintained in a while, so there was a lot of dead spots, he said. For a while, Tidby thought they might have to abandon the project. But Hadfield called him from space, which was "very cool," and asked him what he needed. Tidby told him the amount of footage he'd need to put together a five-minute video, as well as the shots and angles he was hoping for, which included one of Hadfield in front of a window that overlooks earth. "It's beautiful," said Tidby. "It's one of the first shots that shows up in the video and it's the one that takes everyone's breath away," he said. "I took a fill frame, which is going to be his legacy picture, it’s going to be all over the internet." Hadfield "kept delivering," taking time during his lunch breaks or waking up in the middle of the night to get some more footage, said Tidby. "I'd just say, 'Can you get a shot, like push your guitar, make it float through the space station?' And so he would send it and I was like, 'This is so much fun. I’m having so much fun doing this.'" Hadfield called Tidby on Sunday, after seeing the finished product for the first time. "He thanked me, he almost sounded like he was in tears and he just kind of talked about some of the difficulties he had while shooting," said Tidby. "And he goes, 'When I'm back [to Earth] and I get all settled in, 'Come on out to my cottage, let’s have some beers together.' It's like, 'Oh wow! Yes, absolutely!'" Hadfield, who handed over command of the International Space Station to Russian cosmonaut Pavel Vinogradov on Sunday, is scheduled to return to Earth on Monday, with the landing slated for 10:31 p.m. ET in Kazakhstan. Tidby said he will be among those anxiously watching, "waiting for him to stick his head ouf the capsule and give everyone a thumbs up."